Helen digs deeper and stumbles upon the story of the son of a slave who became a well-known artist and fathered a child with a white woman in 1890. When word got out, he was set upon by a lynch mob who cut off his painting hand and replaced it with a hook. The legend says that Candyman can be summoned by saying his name five times into a mirror, whereupon he will kill the summoner. Skeptical of the supernatural entity’s existence, Helen and her friend Bernadette Walsh (Kasi Lemmons) says his name five times into the mirror in Helene’s bathroom, but nothing happens. Braving the gang-ridden housing project to interview residents about the local legend, Helen is confronted by the Candyman who, like A Nightmare on Elm Street‘s Freddy Krueger, is powered by belief and feeds on the fear of those who believe in his existence. 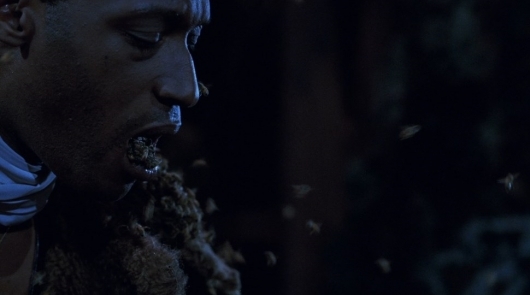 Since Helen is attempting to discredit his legend, Candyman must shed blood to continue his existence. A string of grisly murders ensue, with all the evidence pointing to Helen as the perpetrator. Now, the college student’s only chance for freedom lies with the Candyman, who believes she may be the reincarnation of his former lover. If you haven’t seen Rose’s film, I can’t recommend it enough. Rose creates an unnerving atmosphere, complimented by director of photography Anthony B. Richmond‘s imagery and composer Philip Glass‘s haunting score. 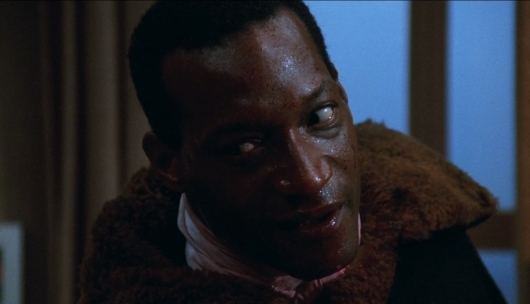 This is the role that turned Tony Todd into a horror icon and it’s easy to see why – his Candyman is every bit as iconic as Robert Englund’s Freddy Krueger or Doug Bradley’s Pinhead. The Collector’s Edition Blu-ray features two different versions of the film, the R-rated theatrical cut and unrated cut. Both versions offer a 2K restoration from a new 4K scan of the original negative in its original aspect ratio (1.85:1), supervised and approved by Rose and Richmond, with the unrated cut using high-definition inserts from an archival film print. 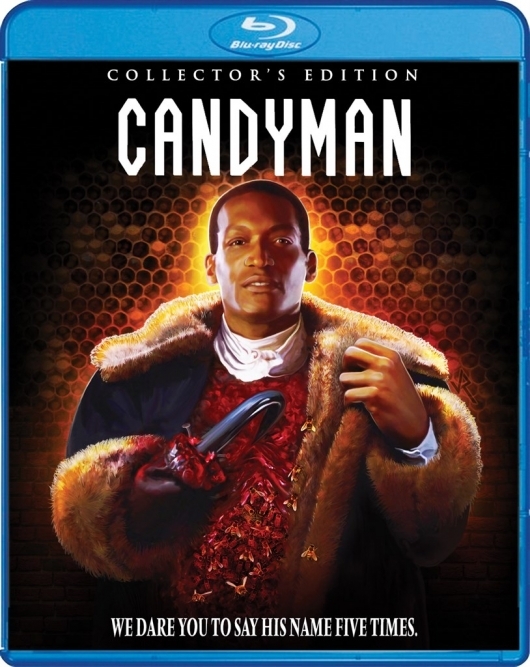 This is the first time Candyman has been available on Blu-ray in the United States and Scream Factory definitely delivered the release fans of Rose’s film have been waiting for. As someone who has only viewed Candyman on VHS and DVD, watching this new high-definition transfer is like seeing the movie for the first time. In terms of audio, English DTS-HD Master Audio 5.1 and DTS-HD Master Audio Mono tracks offer up different experiences, depending on if you’re utilizing a home theater system or prefer a more traditional viewing experience. When it comes to special features, this is another spectacular release for Scream Factory. The first disc, which includes the theatrical cut, offers up two new audio commentary tracks – one with Rose and Todd and another with authors Stephen Jones and Kim Newman. There’s also two previously released tracks – one with Rose, Barker, producer Alan Poul, Todd, Madsen, and Lemmons, and another commentary with Rose, moderated by The Movie Crypt’s Adam Green and Joe Lynch. Rounding out the first disc, there’s “Sweets to the Sweet: The Candyman Mythos,” featuring interviews with the cast and crew, and “Clive Barker: Raising Hell,” an interview with the man himself. There’s also a 2014 interview with Todd, Rose’s storyboards, and your standard assortment of trailers, TV spots, a still gallery, and a BD-ROM copy of the film’s screenplay. On the second disc, you’ll find the unrated cut, with high-definition inserts of the uncut footage from an archival film print, as well as a slew of brand new bonus materials. There’s “Be My Victim,” an interview with Todd, “It Was Always You, Helen” with Madsen, and “Reflection in the Mirror” with Kasi Lemmons. There’s also “A Kid in Candyman” with DeJuan Guy, “The Writing on the Wall: The Production Design of Candyman,” and “Forbidden Flesh: The Makeup FX of Candyman,” including interviews with the film’s special makeup effects artists. And finally, there’s “A Story to Tell: Clive Barker’s The Forbidden,” an in-depth featurette with author Douglas E. Winter on Clive Barker’s seminal Books of Blood and The Forbidden. If you’re into film analysis, there’s “Urban Legend: Unwrapping Candyman,” with writers Tananarive Due and Steven Barnes. Scream Factory’s Candyman Collector’s Edition Blu-ray is now available at Amazon. For more reviews of Scream Factory releases, click here.